- Cook the pasta according to the package instructions, drain and set aside. - In a sauce pan, drizzle some olive oil, set the heat to medium and add the garlic immediately to infuse with the cold oil. Let it go for 6-8min or until the garlic is golden brown. - Add the tomatoes, give them a good stir, increase the heat to a medium-high and let them cook for about 10min or until saucy consistency. - When the tomatoes are done cooking, add the cream cheese. Check for seasoning and adjust with salt and pepper. - Add the fresh parsley and give it a good stir. 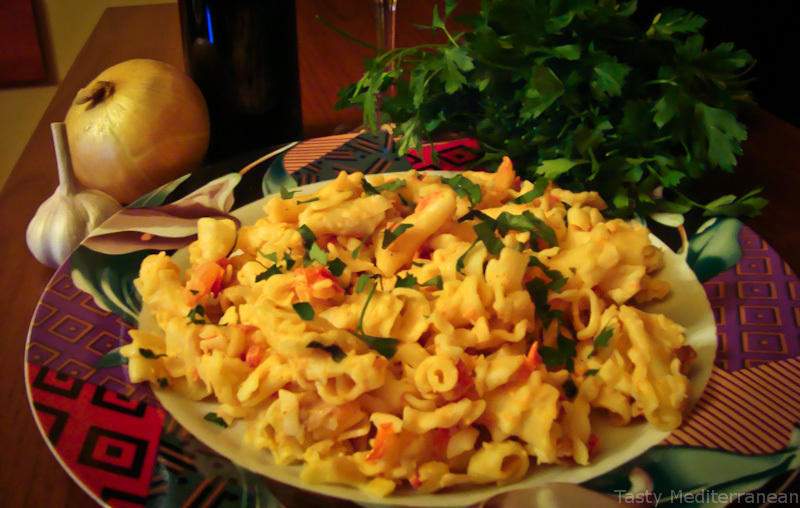 - Add the pasta to the sauce, give it a good toss, add grated cheese on top and enjoy!